Will Obama Order Troops to Fight Ebola in Liberia Clinics? I almost don't know how else to interpret the headlines, whether it's the 167,000 convicted criminal aliens who, despite deportation orders, remain "currently at large," or it's the U.S. consulates in Liberia, Sierra Leone and Guinea that are still issuing travel visas to citizens from these Ebola-stricken nations at a rate of 100 per day. The White House refusal to exercise elementary precautions to prevent an Ebola outbreak in the United States has become another notorious hallmark of the Obama years. I refer to the administration's failure to prohibit travel from the Ebola-stricken region into our formerly Ebola-free nation for the duration of the horrific epidemic. This wouldn't have guaranteed the virus would never surface here -- not with that porous border of ours -- but it would have prevented the initial Dallas outbreak. It would have prevented subsequent Texas cases, continuing havoc, mounting costs and a national panic that is largely a response to a White House demonstrably more committed to the principles of globalism than to the health and welfare of American citizens. Even now, the Obama administration continues to permit 150 travelers from Liberia, Sierra Leone and Guinea to land every day, their unimpeded ease of movement our government's top priority. The rest of us take our chances. So far, our chances are exceedingly good. To date, we are looking at "only" two infected nurses. From the globalist perspective, this mean Obama's policies are working. The golf course beckons. What kind of leader thinks like this? One who doesn't care about Americans as Americans. To Barack Obama, as to all globalists (most of both the Democratic and Republican parties), We, the People, are just interchangeable denizens of the world, subject to the diktats of transnational elites. To keep this utopia moving, the administration has installed temperature monitors at airports. These monitors are expected to check 94 percent of West Africans entering the USA -- and never mind that stealth 6 percent (the Obama administration doesn't). But what's to stop someone from passing undetected by popping a few Advils before deplaning? Presto -- no fever for an airport monitor to pick up, but plenty of deadly germs to spread around the country. Most troubling of all is Obama's outrageous order to send U.S. military forces into the Ebola hot zone. Retired U.S. Army Lt. Gen. William "Jerry" Boykin explained why to WND.com: "This is a president who thinks like a community organizer, and not like a commander-in-chief who takes his responsibility for his troops seriously. At a time when our military has been at war for 13 years, suicide is at an all-time high, (post-traumatic stress disorder) is out of control and families are being destroyed as a result of 13 years of war, the last thing the president should be doing is sending people into West Africa to fight Ebola." Retired U.S. Army Maj. Gen. Paul Vallely also opposes the deployment. Aside from this pair, I haven't seen much criticism. Just as it's important to understand the thinking behind White House policies that permit a steady flow of potential new Ebola cases into this country, it's important to consider what calculus President Obama used to decide to expose some 4,000 service members to a heightened risk of contracting and dying from Ebola in West Africa -- or bringing it home. Is there some "national" interest at stake? Heavens no. If there were, no self-respecting globalist would deploy a single U.S. soldier -- something we know from the absence of troops at our own besieged border where the national interest is paramount. Is there some military mission in West Africa that the battle-tested, also war-weary 101st Airborne Division or U.S. Marines are specifically suited for? The answer again is no. There's no military mission, period. "Fighting Ebola" is not the same thing as fighting a war. Our troops are trained to fight armed enemies, not infectious diseases. Nor is there any "humanitarian mission" these forces are trained to execute. The U.S. military is being sent to provide "structure," "support structure" and "infrastructure" for other organizations, as Army Chief of Staff Gen. Raymond Odierno vaguely told Congress. Commanders emphasize that U.S. troops will have no contact -- "maybe, a tiny amount," Odierno confessed -- with Ebola patients. Meanwhile, they continue training to put on and take off hazmat suits. So why are they there? I dearly hope three House Democrats -- Reps. Keith Ellison of Minnesota, and Karen Bass and Barbara Lee of California -- haven't revealed the answer. In a letter to President Obama noting the difficulties in staffing West African Ebola clinics, these House members requested that U.S. military personnel be allowed "to provide direct care to, and to come into contact, with patients in West Africa." Does this all begin to sound diabolical? 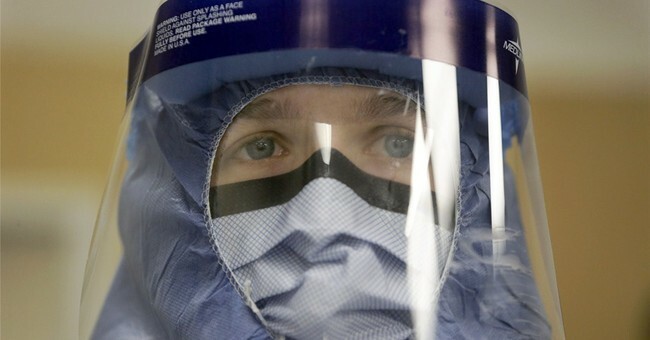 Will we soon be seeing U.S. military manning Ebola clinics? This is a question to give night sweats particularly to military families, who, our leaders need to be reminded, are people, too. There is increasingly overt callousness toward American lives, both civilian and military, at the very top of the government pyramid. That's where totalitarians like to live, by the way. The air is pure up there, and the people look so small.